Bitter Cup: Vanessa Antiopa socks crashed and burned. I tried five times, and failed. Brewing: Two parts: first, I talk about knitting malaise, cumulative stress and what might be wrong with my knitting. Part Two: Ben talks to Denise about her fear of knitting. Taste: I review The Knitted Slipper Book: Slippers and House Shoes for the Entire Family by Katie Startzman. I mentioned Amazon's dynamic pricing, which you can read about here. Chai: I visited a new (to me) yarn shop, Twisted. I love this place! Nice people, nice yarn, cool space. I purchased Hiya Hiya circular needles and like them almost as much as Chaiogoos. Sofa: Project Runway is back and better than ever! Also, check out a Netflix exclusive, Orange is the New Black. Wired: Swell is an app that finds you interesting things to listen to, from news to podcasts to TED talks and more. It is currently only available for iOS, but the creators are reportedly working on an Android version. Events: I'm going to Oregon Flock and Fiber. Are you? Welcome Guest Barista Karen! (CallmeK2 on ravelry) Karen didn't say this on the podcast but she is a masterful knitter and spinner, not to mention a wonderful friend. Latte: Karen and Abby are both knitting the Vanessa Antiopa socks. Karen is using Wollmeise and Abby is using Cascade Heritage. Our socks look quite different and we theorize about why. Karen is also knitting Ysolda Teague's Vivian, but the knitting is stalled at the moment. Karen mentioned Mary Scott Huff's class at Madrona, Planning Ahead for Happy Endings. Sounds like good advice! Grande: Karen finished an eye-searingly bright pair of "Unapologetically Electrical" pink socks; well, sort of. The toe of one sock needs to be shortened by a couple of rows. Chai: When I was in San Francisco, I had the pleasure of visiting Princess Animal, a wonderful knitting "nook" in the back of Serendipity. Kathy (mancall on ravelry), the owner, has a well-curated selection of yarn and knitting and sewing books. It's definitely worth your time and your support! Brewing: We discuss selecting and packing knitting for international travel. We both are thinking of casting on Elizabeth Doherty's Alewives cowl, and other projects. We talk a bit about hot weather knitting, and how to pick a project when you want to knit everything. Stir: The Tour de Fleece continues. Abby's touring, Karen is not. Karen's Matchless is making a sound, most likely due to dry leather footmen. Stay tuned for the cure, which might involve a visit to the horse tack store. 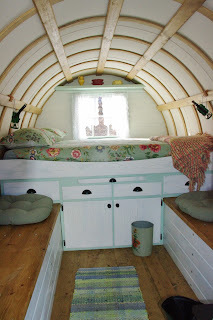 Home made from a repurposed sheep wagon. Sofa: Abby is still deep into The West Wing. Karen has been watching, and loving the British show Sherlock and also talks about You Live in What? which has featured a converted sheep wagon community, among other unusual dwellings. Latte: On the Dressy socks, I'm getting close to being done! I love the pattern - it's not boring! Grande: I finished the knitting on the TNG sweater for Miss Kalendar's imminent baby, but my blocking equipment was packed, so I can't finish it yet. I tried, unsuccessfully to "unvent" a shrug, but without my library of books, I fell short. I did knit a Shoulder Cozy out of Rowan Summer Tweed and Kidsilk Haze but again, it needs blocking. Stir: It's Tour de Fleece time! I started late, and I gave myself a very different goal this year: spin every day. I'm spinning Abstract Fiber Merino/Merino/Silk in the color Gypsy: Teal, blue, purple and grey. It will be a two ply lace weight for a shawl. Segue into: Chai: Eugene, Oregon for the Black Sheep Gathering. I bought fiber from Klaus/Crown Mountain Farms, bought some lovely Angora Fiber from Thedoza's Angoras, Merino Silk from Abstract Fiber and Jacob Roving from Shaggy Bear Farms (no website, sorry!). The highlight was watching Judith judging the Shetland and other fleeces. I share some of Judith's wisdom in this segment. I was reading about Jacob sheep prior to spinning the Jacob roving I purchased at Black Sheep, and learned that some of them suffer from Tay Sachs disease, a horrible genetic disease that affects humans as well. It is possible that these afflicted sheep may someday provide clues to a cure. That's another good reason to preserve these less "popular" breeds. At work this week, I was lucky enough to meet Rojo the therapy llama!!!! Sofa: I've been binge watching The West Wing; it's funny, smart and fast. Also: Joss Whedon's Much Ado About Nothing: delightful!